Save yourself a trip to your computer and invoice from the beach. I use Freshbooks on the web all the time to send out invoices and request payment for various writing and freelance jobs I have. It allows me to create invoices, send them, and have people respond to me as if I have a real business with real invoices. It’s pretty slick. Other features include time tracking, project management, estimates, and expense tracking. Now, there’s an iOS app that lets you do the same things, right from your iPhone. 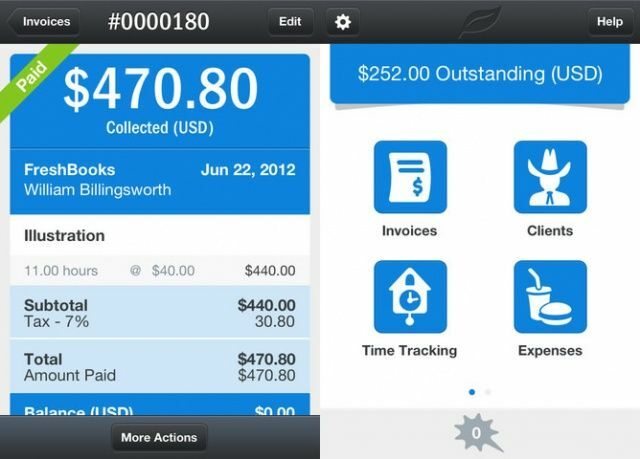 The FreshBooks app itself is universal, letting you use it on both your iPhone or iPad, and it’s free of charge. You do need a FreshBooks account, though, which is also free, up to a certain amount of usage. Launching the app, you’re prompted to enter your FreshBooks account credentials, and then you’ll be good to go. I used it to send last month’s invoice to Cult of Mac, and it was fairly straightforward. Anyone familiar with the functions on the web interface will have no problem here. I do wish I got some sort of “invoice sent” confirmation, but it did go to the intended recipient. As for the other features, like time tracking, taking photos of expense receipts, and the like: it all seems to work fairly cleanly. What’s cool is that you can work on the web or on your iPhone, or on your iPad, entering data and sending invoices, and generating reports. Your stuff is just out there, in the cloud, protected by 256-bit encryption and multiple data centers. For those of us with no accounting background whatsoever, FreshBooks is a great way to track these important transactions. Now that I can take care of these things on the go, it’s just that much more of a valuable service. If you’re a FreshBooks user, you should give this a look, and let us know what you think in the comments below.